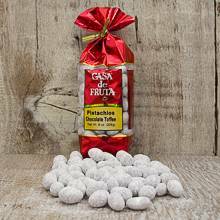 We have made our premium pistachios even tastier by covering them in a toffee coating and rich milk chocolate, and then rolled in powdered sugar. These are sure to be a new favorite treat in your home. Packaged in an 8 oz. gift bag. From Karen of Carmichael, California on 7/29/2013 .